How can visually impaired pedestrians better navigate the city? The following research and design project aims to address the challenges that visually impaired pedestrians face when navigating the city. Many technological solutions have been made available to assist these pedestrians in traversing the streets safely. Yet we believe that the conveyance of this necessary information could be achieved by utilizing a much simpler tactile method, integrated within the existing urban infrastructure of New York. This citywide approach will serve as a prototype for the handling of any type of interruption to pedestrian traffic by the creation of a parallel communication channel. The integration of this system will require minimal intervention into standard sidewalk construction processes. As an alternative approach that develops over time, keeping up with city growth and reinvention, this project can avoid the difficult implementation most major infrastructure projects entail. Independent navigation in a constantly changing environment like New York City presents a great challenge for visually impaired pedestrians. Visually impaired pedestrians rely heavily on memory to navigate through public space in the city. This memory relies on sounds, tactile surfaces, smell and previous experience. Interruption to pedestrian movement, particularly construction work, poses an obstacle that may deter visually impaired people from passing through the area. Various other interventions in New York City’s public space pose similar challenges, from film shootings to street fairs. Yet due to the relatively long processes inherent to building assembly, construction generally tends to be the longest interruption to public circulation in the city. Our proposal suggests a city wide strategy with emphasis on pedestrian interruptions. In addition to existing visual cues, a tactile path will be integrated into each sidewalk in the city. Tactile notation in contrasting colors along the path will draw attention to key points of interest along the street, such as public transportation stops, building entrances, street furniture and information poles. As part of this strategy each city block will be divided into four segments, indicated on the tactile path. The block’s break down in distance and scale creates additional points of reference, serving as tactile “addresses” for buildings, stations and street furniture. The implementation of the tactile path requires no more than a simple metal brush or stamp, to be applied while the sidewalk concrete is curing. Alternatively if the concrete has already set, a saw can be used or prefabricated pavement panels can be installed. Applied on top of the tactile path to indicate upcoming interruption. The surfaces will be connected and secured to the path using grooves in the concrete. The triangular surface pattern will safely direct the pedestrians through the detour, indicating where to turn. Braille writing and textured surfaces applied to top edge will convey tactile information to pedestrians who use service dogs. Bottom edge allows for detection with a cane and creates a uniform identification for different barriers. Scaffolding tends to be confusing. Guiding edges could be attached to these as well as to various other types of construction barriers. 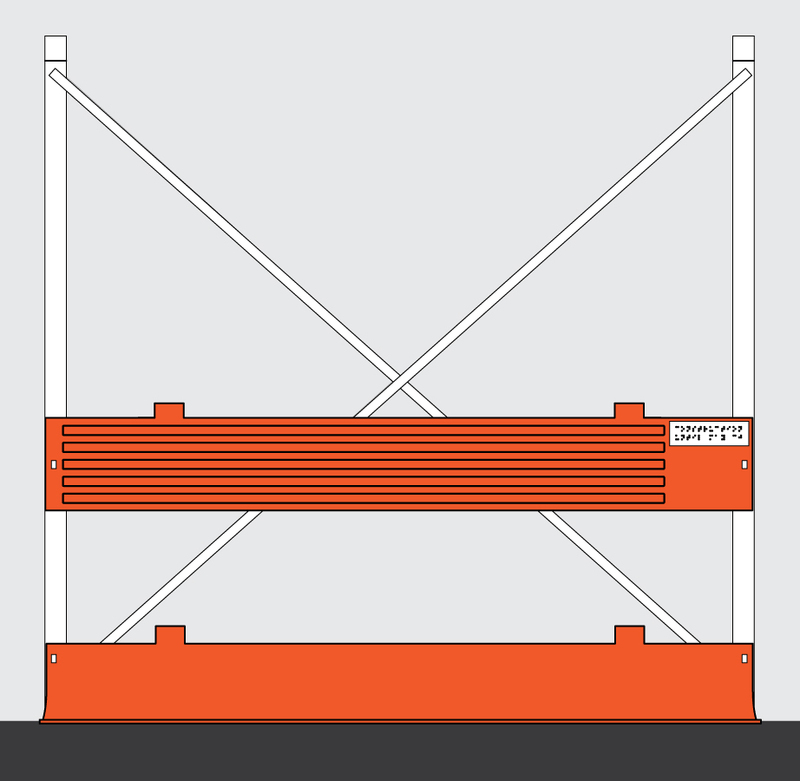 The sensitive sound device can be easily attached to existing barriers. It will inform pedestrians of upcoming interruptions and will guide their passage through the detour. Pedestrians will know to turn in the direction opposite to the sound. The volume level and duration of repetition is responsive to the number of people and the surrounding sound level. Modular elevated platforms can be installed in instances of long term interruption to pedestrian traffic. The platforms will direct pedestrians and continue the standard tactile notation of the street. Modular, reusable and easy to assemble, the platform pieces and will provide safe passage through the detour. The space under the elevated platform can be utilized for cables and other construction needs.